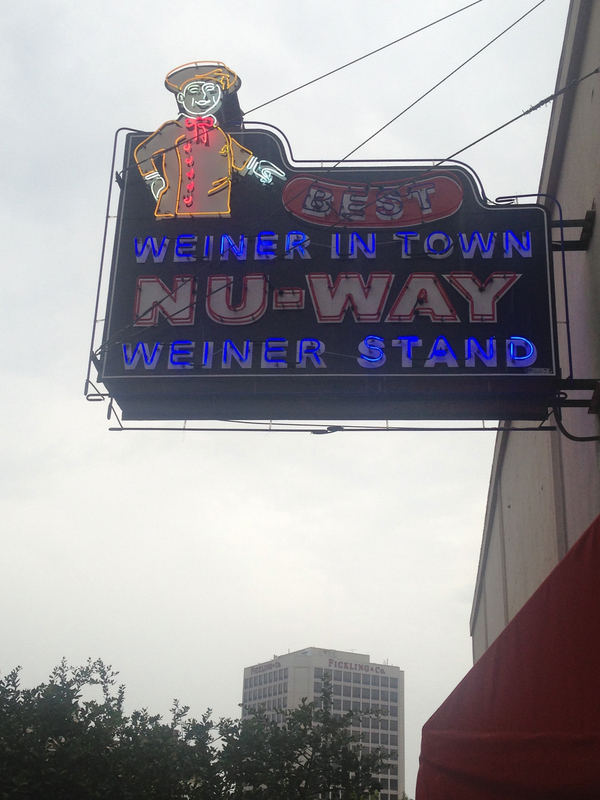 On multiple previous occasions, I had tried to go to Nu-Way Weiner Stand and failed. It seems that we always were driving through Macon either before lunch or on a Sunday, neither being times that worked (they’re open 6:00 am – 7:00 pm weekdays and 7:00 am – 6:00 pm on Saturday). Over a holiday weekend we were driving though and thought we’d try again, but they had the day off, too. 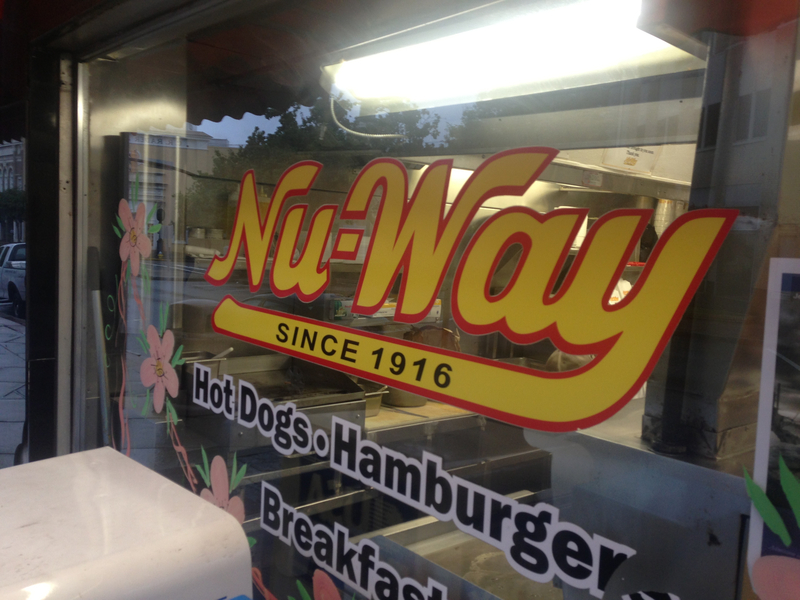 I actually first heard about Nu-Way in the Garden & Gun article – the hundred southern food you absolutely, positively have to try before you die. Their recommendation was the chili slaw dog. Just three years shy of their centennial – they opened in 1916 (and twenty minutes before closing), we finally made it to their original location downtown on this Wednesday night. Arriving that late, other than the three folks who had already ordered and were waiting for carry-out, we had the place to ourselves. This led to an ongoing conversation with Charles, the cashier and cook. 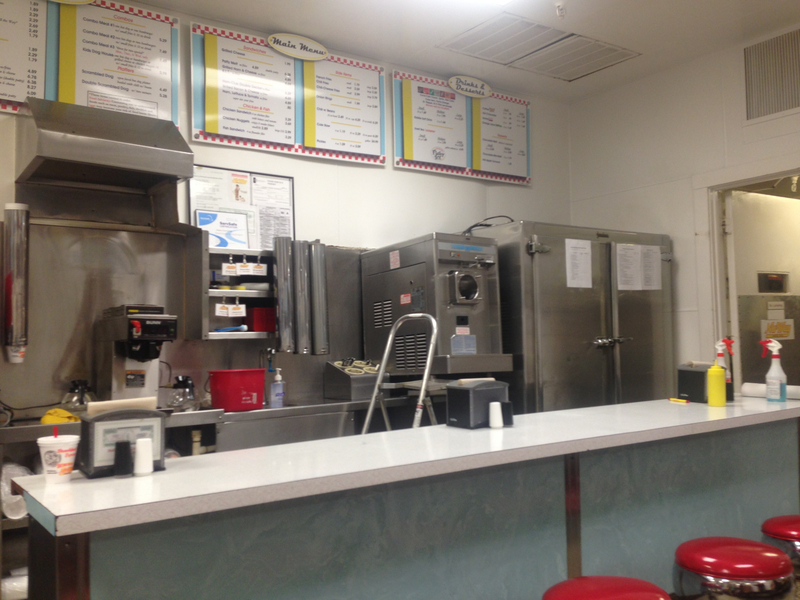 This location is a combination diner / hot dog stand – before 2:00 pm, you take a seat at the counter or a booth and a wait-person serves you. After 2:00, you place your order at the counter and take a seat along the bar or at one of the booths along the wall and wait for your food. Their other eight locations (all Macon, Warner Robins and Fort Valley) don’t operate on the exact same schedule, so if you choose to “go a long way for a Nu-way”, check the hours at the location you’re heading to at the restaurant link above. Not being a slaw fan, I chose the scrambled dog, a hot dog (I had a single, you can also get a double) served open-faced on a bun covered in chili and oyster crackers. Oyster crackers seemed like an odd condiment when I read about it, but when it arrived and I saw the amount of chili, it made perfect sense. The mustard was added by me. I’m generally not a yellow mustard fan, but a chili dog just doesn’t taste “right” without it. The scrambled hot dog must be a middle-Georgia phenomenon, because I’ve also read about the one at Dinglewood Pharmacy in Columbus, with the difference being that they chop up the hot dog there. What we thought of the hot dogs? Did we see the pictures on the wall (they were hard to miss) of when Oprah came to visit? It was a good chili dog. 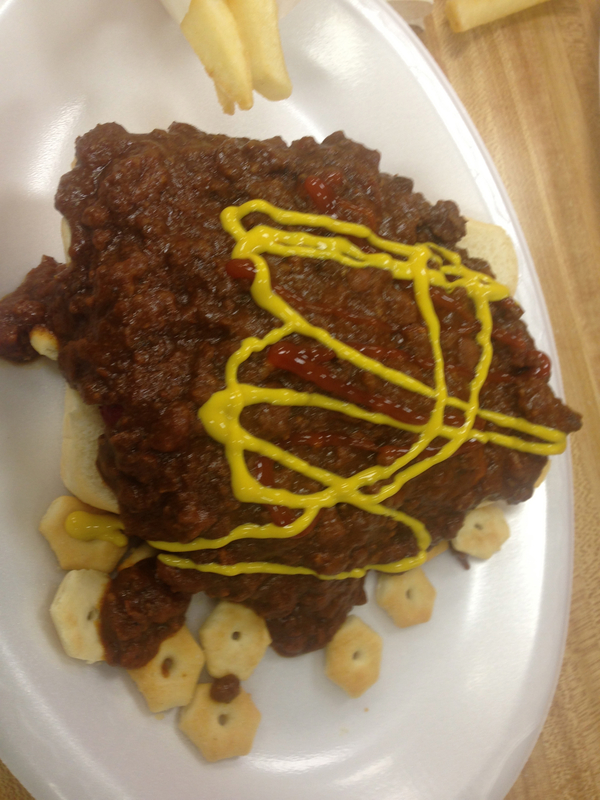 It was an interesting chili dog. But it wasn’t a great chili dog. Jo chose the classic chili slaw dog, which was not transcendent. She said that it was perfectly acceptable, but it definitely wasn’t an all beef Oscar Mayer dog, which pretty much knocked it out of contention for her. The order of fries that we split were frozen, not fresh, which always seems to tip the scales in the negative direction for me. We ate quickly, trying to get out the door and not keep the guys there too late. Next time we’re in Macon, I think we’ll be meeting one of our daughter’s friends at the Rookery. How many people want to start their day with a chili weiner at 6 am? Exactly why we hadn’t been before. They serve a full breakfast menu until late morning (10:30 – 11:00). I don’t know if chili dogs are available all day. They are at Martin’s!